Fighters gain a +2 class bonus to Strength or Constitution, as long as it isn’t the same ability you increase with your +2 racial bonus. Possible backgrounds include: swordmaster, mercenary captain, sea raider, shieldwall spearman, explorer, bouncer, thug, city guardsman, former gladiator, former orc captive, bankrupt nobleman, duelist, and goblin-hunter. 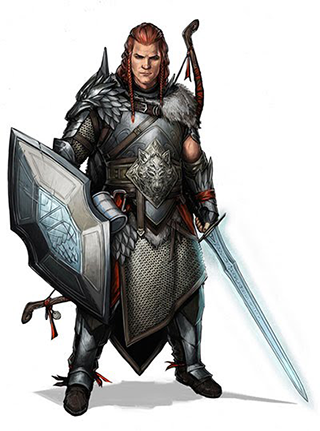 At 1st level, a fighter starts with a melee weapon or two, a ranged weapon if they want it, armor, and standard non-magical gear that is suggested by the character’s backgrounds. Fighters may start with either 25 gp or 1d6 x 10 gp. Fighter weapon attack maneuvers deal damage based on the fighter’s level. You also don’t have to keep track of upgrading a 1st level maneuver into a 3rd level maneuver, because all the maneuvers function at your level. You can change which maneuvers you know and have ready whenever you gain a level. Fighters have two class features: Extra Tough and Threatening. Adventurer Feat Increase your total recoveries by 1. Whenever an enemy attempts to disengage from you, it takes a penalty to its check equal to your Dexterity or Constitution modifier, whichever is higher. The penalty doesn’t apply if you are stunned, grabbed, or otherwise incapable of making an opportunity attack. Adventurer Feat Whenever an enemy fails to disengage from you, you also deal damage to that enemy equal to your Dexterity or Constitution modifier. At 5th level, damage is double the modifier. At 8th level, it’s triple. Champion Feat Whenever a non-mook enemy fails to disengage from you, it’s vulnerable to your attacks for the rest of the battle. You get an additional fighter class talent at 6th level. Once per battle as a quick action, roll 1d20 + Charisma + your level against a nearby target’s MD. If successful, that target’s AC and PD against your attacks and powers are reduced by the escalation die value for the remainder of the combat. Special: If you target a mook with this ability, it affects every member of their mob. Adventurer Feat Using bravado is now a free action. Once a day, you may use this ability twice in a battle. Champion Feat The target’s attack and damage rolls against you are also reduced by the escalation die value for the remainder of the combat. Epic Feat Once staggered, the target of this power also becomes hampered. It may make a normal save (11+) at the start of each turn to negate the condition for that turn only. Once per battle, make a fighter melee attack as a free action after one of your melee attacks drops an enemy to 0 hp. Adventurer Feat If you have your move action available, you can use it before making your Cleave attack to reach an enemy you are not already engaged with. Champion Feat You can use Cleave twice each battle, but only once a round. Epic Feat You gain a +4 attack bonus with your Cleave attacks. Once per battle as a free action, make another attack with a –2 penalty after your first fighter attack during your turn misses. Adventurer Feat You no longer take the –2 penalty to your Comeback Strike attacks. Champion Feat Once per day, you can use Comeback Strike twice in a battle. Epic Feat You gain a +4 attack bonus with your Comeback Strike attacks. Adventurer Feat Your Counter-Attack attack now deals full damage. Champion Feat You can use Counter-Attack once per turn instead of once per round (in effect, you’re free to Counter-Attack once per enemy turn). Epic Feat You can now use Counter-Attack when the escalation die is 3+. Your attacks with d8 ranged weapons (heavy crossbow, longbow) now deal d10 damage per level. Your attacks with d6 ranged weapons (light crossbow, shortbow) now deal d8 damage per level. In addition, your misses with basic ranged attacks deal damage equal to your level. Adventurer Feat If you spend a quick action to aim before making a ranged basic attack, add your Dexterity modifier to the damage if you miss. Champion Feat Once per battle, expand your crit range with a fighter ranged attack by 4 (usually to 16+) for that attack. Declare you’re using this feat power before you roll the attack. Epic Feat Your crit range with ranged weapon attacks expands by 1 (usually to 19+). At the start of a battle, you may spend a recovery in order to go first (effectively claiming the highest initiative). If more than one creature in a fight uses this maneuver, the creature with the highest Dexterity modifier goes first (roll 1d20 to break ties). Adventurer Feat You gain a bonus to your AC equal to the higher of your Dexterity or Wisdom modifier until the escalation die is equal to your level. Champion Feat You also gain a bonus to your PD equal to the higher of your Dexterity or Wisdom modifier until the escalation die is equal to your level. Epic Feat You may spend a recovery at the start of a battle to take a full turn before everyone else does and then still roll initiative normally, taking your usual turn on that initiative count. Once per battle while wearing heavy armor, when you are hit by an attack that targets AC, as a free action, you can take half damage from that attack instead. Adventurer Feat Once per day, you can use Heavy Warrior twice in a battle (against different attacks). Champion Feat You can also use the power against an attack that targets PD. Epic Feat Once per day, you can reroll a recharge roll for a magic armor power. Deal 1d4 additional damage per level if you are using a one-handed weapon. Deal 1d6 additional damage per level if you are using a two-handed weapon. Adventurer Feat You deal the additional Power Attack damage even if the attack misses. Champion Feat One battle per day, you can use Power Attack twice in the battle. Epic Feat One-handed weapon damage using Power Attack increases to 1d6 per level; two-handed weapon damage using Power Attack increases to 1d8 per level. Once per battle, you may spend a recovery as a quick action to immediately reroll a save with a bonus equal to the escalation die. Adventurer Feat Using resist & endure is now a free action. Once a day, you may use this ability twice in a battle. Champion Feat The affected save automatically succeeds with no roll required when you spend a recovery. Epic Feat Your first use of resist & endure after a quick rest or full heal-up does not use up a recovery. Once per round as a free action, roll a normal save (11+) to intercept an enemy who is moving to attack one of your nearby allies. You can pop free from one enemy to move and intercept the attack. If you are engaged with more than one enemy, the others can take opportunity attacks against you. The moving enemy makes its attack with you as a target instead. If you’re wearing heavy armor and the attack hits, you only take half damage. Adventurer Feat You can pop free from up to two enemies when using Skilled Intercept. Champion Feat You gain a bonus to your Skilled Intercept save equal to the escalation die. Epic Feat Enemies can’t make opportunity attacks against you during your Skilled Intercept movement. Whether by questioning their parentage, disparaging their shoddy construction, or insulting the icon they serve, you attempt to draw the ire of an enemy. Once per round, you can roll 1d20 + Charisma + your level against a nearby target’s MD as a quick action. If successful, all allies gain resistance 12+ against the target’s attacks and powers until the start of your next turn; however, the target’s crit range on its attacks against you is increased by 2 for the same duration. This effect immediately ends if you don’t remain engaged or nearby the target creature. Special: If you target a mook with this ability, it affects every member of their mob. A single target (or mob) cannot be affected by more than one character’s Taunt ability at once. A character with this Talent cannot benefit from its use by another character while their Taunt effect is active. Adventurer Feat If the target of your Taunt attacks one of your allies while affected by this Talent, it takes psychic damage equal to your Charisma modifier. This damage is doubled at 5th level and tripled at 8th. Champion Feat Your allies’ resistance improves to 16+. Epic Feat Your allies’ resistance improves to 18+. Adventurer Feat Once per day, you can rally twice during a battle as a quick action, without needing to roll a save for the second rally. Champion Feat Increase your total number of recoveries by 2. Epic Feat When you roll a natural 20 with an attack, you gain an additional use of Tough As Iron this battle. Effect: Until the end of your next turn, the first critical hit you take from a melee attack becomes a normal hit instead. Adventurer Feat Brace for it now works against a critical hit from any type of attack. Champion Feat Brace for it works against any number of critical hits before your next turn. Effect: Your crit range with melee attacks expands by a cumulative +1 this battle until you score a melee critical hit. When you score a melee critical hit, your crit range drops back to normal. Champion Feat The crit range bonus from carve an opening is +2 instead of +1. Effect: Add the higher of your Intelligence or Wisdom modifier to your next damage roll against your target. Adventurer Feat You may instead grant this bonus damage to a nearby ally against the missed target. Champion Feat The bonus damage is now equal to your INT or WIS, plus the escalation die value. Epic Feat The bonus damage is now equal to your INT or WIS, plus double the escalation die value. Adventurer Feat Now you can reroll both 1s and 2s with deadly assault. Champion Feat Deadly assault now also triggers on a natural 17+. Effect: Gain a +2 bonus to AC until the end of your next turn. Adventurer Feat You also gain the bonus to Physical Defense. Champion Feat The bonus increases to +3. Epic Feat You also gain the bonus to Mental Defense. Effect: You gain a bonus to your miss damage with that attack equal to the escalation die. Champion Feat If you attacked with a two-handed weapon, heavy blows can trigger on any miss, odd or even. Epic Feat The bonus instead equals double the escalation die with a one-handed weapon, or triple it with a two-handed weapon. Effect: The target must make a normal save (11+) or be dazed for 1 turn. Adventurer Feat Add your Strength modifier to your miss damage. Champion Feat The target is instead confused for 1 turn, then dazed for 1 turn (no save for either condition). Effect: You gain a bonus to the damage roll equal to your Dexterity modifier. At 5th level, the damage bonus increases to double your Dexterity modifier; at 8th level the damage bonus increases to triple it. Adventurer Feat You can now use precision attack with a ranged attack. Effect: After this attack, you can make a basic ranged attack with the same weapon (as long as it’s not a weapon that takes a quick action to reload or draw) with a –4 attack penalty. You can’t use any maneuvers with the second attack. Champion Feat The second shot attack penalty is –2 instead. Special: You must be using a shield. Effect: The target pops free from you after the attack (does not allow opportunity attacks). Adventurer Feat If the target is also engaged with any of your allies, you can have it pop free from them as well. Champion Feat Once per battle, you can also daze the target (save ends) of your shield bash attack, if that enemy is staggered. Special: You must be using a weapon in each hand. Effect: Until the end of your next turn, you gain a +2 melee attack bonus against the target. Champion Feat The bonus increases to +4. Special: When you use this maneuver, you lose your next move action, whether on this turn or on the next. Effect: One ally who is engaged with the target pops free and may immediately move to any nearby location. Adventurer Feat Until the start of your next turn, the affected ally adds the escalation die to their AC and PD against opportunity attacks, as well as to any disengage checks made. Champion Feat The affected ally may instead immediately move to any far away location but must sacrifice their next move action to do so. Special: You can use this maneuver only once per round. Effect: Make another melee weapon attack against a different target. Effect: You forego miss damage against the targeted enemy in order to give a nearby ally double the escalation bonus on their next attack roll against that same enemy. Adventurer Feat The targeted enemy also becomes vulnerable to your affected ally’s next attack. Champion Feat The affected ally also gains an extra weapon die to their next damage roll against the same enemy. Effect: Add the higher modifier from your Strength or Dexterity to the miss damage. At 5th level the damage bonus increases to double your chosen modifier; at 8th level the damage bonus increases to triple it. Special: You can use this maneuver only when you make an opportunity attack. Effect: The target is dazed until the end of its turn. Adventurer Feat If the target was moving, it stops moving and loses the rest of its move action. Champion Feat The dazed effect is now save ends. Epic Feat The target is now weakened (save ends) instead of dazed. Effect: You gain temporary hit points equal to your Constitution modifier. Champion Feat The temporary hit points increase to double your Constitution modifier. Effect: One ally next to you (including an ally engaged with the same enemy as you) gains a +2 AC bonus until the start of your next turn or until you are no longer next to them. Champion Feat Bonus also applies to PD. Epic Feat Bonus increases to +3. Effect: You deal half your normal basic attack damage to the target. That target suffers ongoing damage equal to double the higher of your Intelligence or Wisdom modifier or triple it at 8th level. Champion Feat You can now trigger wounding shot with a natural even hit, and ending the ongoing damage requires a hard save (16+). Effect: The target also takes ongoing damage equal to double your Dexterity modifier, or triple it at 8th level. Champion Feat Once per battle, you can trigger a dozen cuts with a natural odd hit. Effect: Add +2 to the attack roll, then halve any damage dealt by the attack if it hits. Champion Feat Add +4 to the attack roll instead of +2. Epic Feat The damage is no longer halved on a hit after using hero’s skill. Effect: If the target of your attack is standing near a wall or object, your shot pins the target’s clothing or flesh to that surface and it becomes stuck. On their turn, the target may use a move action to free themselves and negate the condition, but doing so requires a normal save (11+), and it suffers 1/2 your normal basic attack damage as it pulls itself loose. Champion Feat This attack targets PD rather than AC, and the save difficulty to negate the stuck condition increases to hard (16+). Special: You must have the Skilled Intercept talent to use this maneuver. Effect: The next time you use Skilled Intercept this battle, your Skilled Intercept save automatically succeeds. Effect: You deal 1/2 of your normal basic melee attack damage, and the target is hampered for a number of turns equal to your Strength modifier. A normal save (11+) ends the condition. Champion Feat The target must make a hard save (16+) to end the hampered condition. Epic Feat You now deal your full basic attack damage when using this maneuver. Special: You must be staggered in order to use this maneuver. Effect: Your attack against the target deals double the normal amount of damage, but you also suffer half the amount inflicted. Any allies engaged with the target may immediately pop free. Epic Feat Your target is stuck until it makes a hard save (16+), but you are also stuck and become vulnerable to its attacks and powers until it is no longer stuck. Effect: You can roll a save against a save ends effect. Epic Feat You gain a +2 bonus to the save. Effect: After dealing damage, you can pop free from the target, move to a different nearby enemy, and make a basic melee attack against that enemy. You can’t use any maneuvers with the second attack, and it deals only half damage. Epic Feat This maneuver can now affect any other enemies nearby the target of your shot, engagement notwithstanding. The maximum number of affected targets still may not exceed your Dexterity modifier. Special: You must have moved before the attack. Effect: You deal 1/2 your normal basic attack damage to your target and any other enemies who are engaged with the same creature as your target. However, the maximum number of affected targets may not exceed your Dexterity modifier. Epic Feat If the escalation die is 3+, the second spinning charge attack deals full damage. Effect: You can heal using a free recovery. Epic Feat If the escalation die is 3+, you can now trigger sword of destiny with a natural 18+. Special: You can use this maneuver only once per battle. Effect: Increase the escalation die by 1. Epic Feat Combat mastery now also triggers on any natural even hit. Effect: The crit range of your attacks against the target expands by 3 (generally 17+) until the end of the battle (cumulative). Epic Feat The crit range bonus from set ’em up now also applies to any ally who attacks the target while you are engaged with it.